Volkswagen unveiled two micro mobility concepts in Geneva Motor Show, the Streetmate e-scooter that can be driven while sitting or standing; and the three-wheeled Cityskater, called the “last mile surfer”, a collapsible standing scooter steered by shifting weight. Volkswagen treats the two electric scooter concepts solutions for urban micro mobility, that is mostly the final mile. Despite the option for the seat to be folded away, permitting the rider to drive the electric scooter in a standing position if legislation permits, the two-wheeler comes with a 2 kW motor. 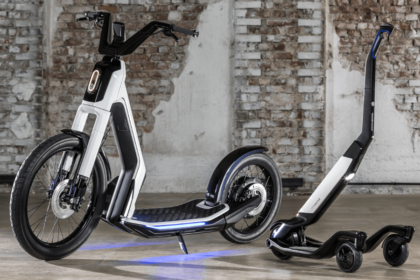 Incorporated into the rear wheel, it provides the electric bike a top speed of 45 km/h and a range of 35 km. 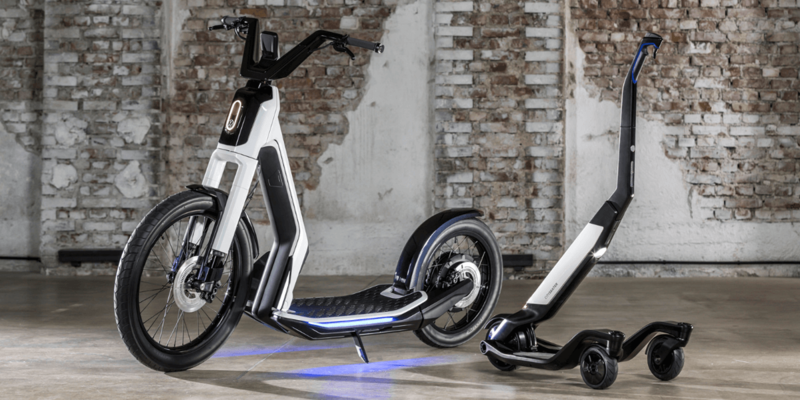 Still, the Streetmate concept scooter is relatively light (65 kg), has a low center of gravity with its 1.3 kWh lithium-ion battery incorporated into the floor structure. Germany’s automaking giant states that its micro mobility concept can be completely recharged in 2 hours and 15 minutes at a charging station with a charging power of 500 watts. Alternatively, the battery can be taken out and connected to any domestic socket. A nearly compulsory selling point for electric vehicles these days is connectivity. Streetmate does this with a large display in the middle of the handlebars playing the role of a weather-proof control center. It can also connect to a smartphone to then get navigation data. The scooter’s app triggers an alarm if someone attempts to start the scooter. The app consists recognition of multiple authorised drivers, turning the smartphone into a digital key. The Cityskater is Streetmate’s little sibling in the form of a three-wheeled collapsable “last mile surfer”. Such a micro mobility concept is steered by means of the rider moving their weight whereby a control rod gives the necessary stability. This makes the steering similar to skiing or riding a Segway. The little Cityskater has a leading speed of up to 20 km/h and a 15 km range. The idea of this concept is that its light weight of 11.9 kilos indicates that it can be taken on public transport or in a car for the last stretch of the person’s journey. CitySkater has a lithium-ion battery that can be charged using a standard domestic socket, indicating the three-wheeler can also be charged on a train. Nothing has been said on plans for production.